How Could the Intestinal Microbiota Contribute to Celiac Disease? Bacteria in the small intestine metabolize gluten differently, to increase or decrease its immunogenicity, researchers report in the October issue of Gastroenterology. This interaction between microbes and gluten could help determine the risk for autoimmune enteropathy in genetically susceptible individuals and underlie the reported association between dysbiosis and celiac disease. Gluten proteins, predominantly gliadins in wheat, are resistant to complete degradation by mammalian enzymes, resulting in production of large peptides with immunogenic sequences, such as the 33-mer in α-gliadin. Overall, this specific peptide contains 6 copies of 3 different epitopes (PYPQPQLPY, PQPQLYPQ, PFPPQPQLPY) to which most patients with celiac disease react. Partially digested gluten peptides translocate the mucosal barrier and are deamidated by human transglutaminase 2, the autoantigen associated with celiac disease. This process converts glutamine residues to glutamate and increases peptide binding affinity to HLA-DQ2 or DQ8 heterodimers in antigen-presenting cells, initiating a T-cell−mediated immune response. Up to 40% of most populations carry celiac disease susceptibility alleles, yet only 2%−4% develop the disease. Little is known about the other factors that increase risk. As with other autoimmune and inflammatory diseases, intestinal dysbiosis, characterized by abundance of Proteobacteria and decreases in Lactobacillus, has been reported in patients with celiac disease. Imbalances between pathobionts and core commensals in the proximal small intestine could affect susceptibility to celiac disease. Gluten proteins rich in proline residues are only partially digested by human proteases generating large and immunogenic peptides, such as the 33-mer peptide. Partially degraded gluten peptides (such as a 33-mer) could be metabolized by bacteria such as P aeruginosa, producing slightly shorter peptides, but with retained immunogenicity. These P aeruginosa−modified gluten peptides translocate the mucosal barrier more efficiently to interact with antigen-presenting cells expressing HLA-DQ2. On the other hand, P aeruginosa−modified gluten peptides can be further detoxified by other members of the duodenal microbiota, such as Lactobacillus spp. The metabolic activity of Lactobacillus produces peptides shorter than the 9 amino-acid length required for efficient antigen binding to HLA-DQ2 and activation of T cells. 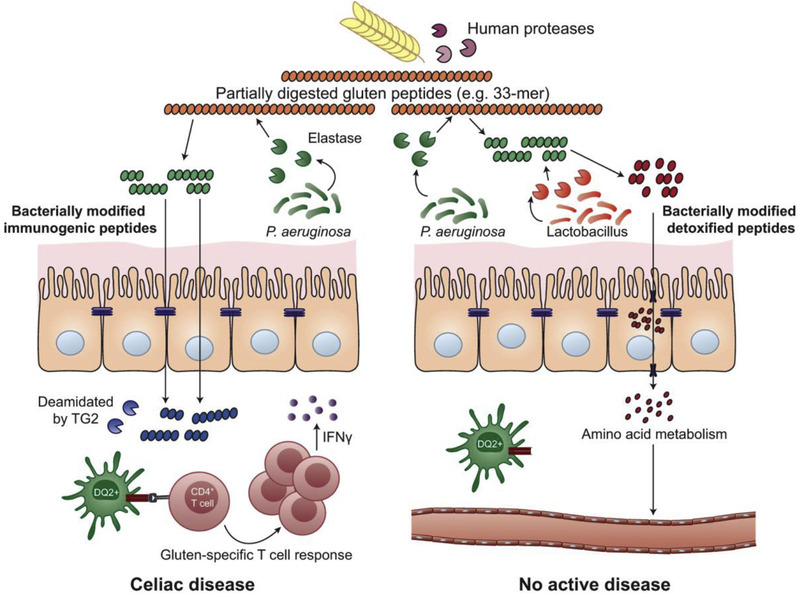 Alberto Caminero et al investigated gluten metabolism by opportunistic pathogens and commensal duodenal bacteria, and characterized the capacity of specific peptides to activate gluten-specific T cells from patients with celiac disease. They colonized germ-free C57BL/6 mice with bacteria isolated from small intestinal biopsies of patients with or without celiac disease; bacteria were selected for their in vitro gluten-degrading capacity. One week later, the mice were given a gliadin or saline (control) challenge; small intestine tissues were collected and gliadin and proteolytic activities were measured. Peptides produced by the mice were characterized by liquid chromatography tandem mass spectrometry and their immunogenic potential was evaluated using peripheral blood mononuclear cells from patients with celiac disease after a 3-day gluten challenge. Caminero et al found that colonization of mice with different bacteria produced distinct gluten-degradation patterns. Pseudomonas aeruginosa, an opportunistic pathogen isolated from patients with celiac disease, had elastase activity and produced peptides that better translocated the mouse intestinal barrier. These P aeruginosa−modified gluten peptides activated gluten-specific T cells from patients with celiac disease. The authors stated that P aeruginosa produced shorter gluten peptides that were often highly immunogenic, inducing responses as strong as the parent 33-mer. These shorter peptides readily crossed the epithelial barrier. Caminero et al found the elastase LasB to be the main protease involved in gluten metabolism by P aeruginosa. In contrast, Lactobacillus spp. from the duodenum of individuals without celiac disease degraded gluten peptides produced by human and P aeruginosa proteases, reducing their immunogenicity. The authors propose that pathogens such as P aeruginosa in the small intestine may contribute to development of celiac disease through their pattern of metabolism of gluten. Caminero et al state that it is important to characterize the microbial proteases involved in gluten metabolism, as well as the derived peptides released, before they are targeted therapeutically in patients with celiac disease. Bacterial interactions appear to affect gluten-degradation patterns and peptide output. In the mice, bacterial communities dominated by Lactobacillus metabolized gluten quickly and effectively. Caminero et al found that Lactobacillus could detoxify gliadin peptides after partial digestion by human proteases, as well as the immunogenic peptides produced by P aeruginosa proteases. The authors stress that the strains tested in this study are not the only ones that could potentially modify risk for celiac disease. Further studies are needed to identify these. Eventually, inflammation in patients with celiac disease might be reduced by inhibiting elastase and similar proteases or increasing the protective enzymatic activity of certain bacteria.